When should one contemplate a surgical approach? Is it advisable to self-treat the ganglion cyst by hitting it with an object to make it burst? At this point I like to stress never to hit a ganglion cyst with any object!!! Time and again ganglion cyst patients receive the advice by individuals of their surroundings to hit the ganglion cyst with objects like a bible (also sometimes referred to as “bible therapy”) or a hammer. I urge you not to follow this “well-intentioned advice”. In hand-surgical literature the consequences of such measures – among other things – describe cases that ended with fractures. I myself once was confronted with a case of a severe vascular damage to the radial artery of the wrist. 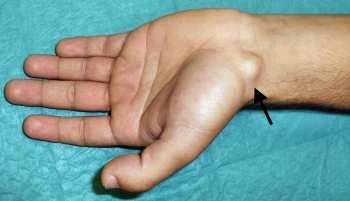 Particularly when – as seen in the picture – the ganglion cyst is located close to the radial artery hitting it can be very dangerous. Can a ganglion cyst of the wrist be treated by aspiration? A much more reasonable non-surgical approach to treating a ganglion cyst is to have a physician perform an aspiration. Even if this measure may only lead to a permanent solution for very few patients, still it is worth a try prior to proceed to surgery, since aspiration is much less straining than a surgical procedure. An aspiration on a ganglion cysts located along the radial artery on the other hand is very problematic since it is possible to puncture and hurt the artery due to a lack of visibility in this area. The consequence thereof may be a very large hematoma on the wrist. I do recommend surgery for the majority of ganglion cysts of the wrist which do persist over several months and do not show any signs of regression. It is particularly advisable to remove ganglion cysts of the wrist when they are very large and disturb the appearance. Equally advisable is the removal of those ganglion cysts which cause pain or pressure onto nerves. Can ganglion cysts be removed as outpatient procedures? Yes, in fact the surgical removal of ganglion cysts of the wrist typically occurs on an outpatient basis. In isolated cases when dealing with extremely large ganglion cysts for example, or if the ganglion cyst is located fairly close to the radial artery on the flexion side of the wrist, a hospitalization may be appropriate. Each surgery on a ganglion cyst has to be performed under the same considerations as any other surgery to the hand. This means that an appropriate anesthesia as well as a bloodless operating surface along with the appropriate hand-surgical set of tools is mandatory in order to achieve a successful result. Is it possible that a ganglion cyst to the wrist returns after it was surgically removed? Yes! Any ganglion cyst of the wrist may return after surgical removal, aspiration or any other appropriate therapy! In medicine this is referred to as recurrent cyst!